The United States Congress designated the Orocopia Mountains Wilderness (map) in 1994 and it now has a total of 51,289 acres. All of this wilderness is located in California and is managed by the Bureau of Land Management. 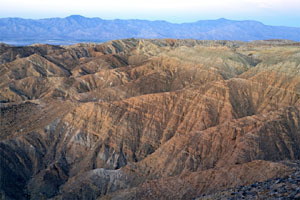 The Orocopia Mountains Wilderness is bordered by the Mecca Hills Wilderness to the west. Immediately to the east of Mecca Hills Wilderness, you'll find Orocopia Mountains Wilderness, where the unpredictable forces of nature--primarily the San Andreas Fault--have created a striking landscape of open desert valleys, ridges, and dramatically colored and eroded canyons. The canyons and washes are deep and often extremely long, with exposed walls shaded from bright red to dark black. Despite the harshness of the climate, you should see a wide variety of plants and animals adapted to life in the desert. Bighorn sheep and burro deer live in the mountains, and desert tortoises crawl below. In washes and along stony slopes, you may encounter the spiny-leaved Orocopia sage, Alverson's foxtail cactus, Orcutt's woody aster, and the Mecca aster. Keep an eye open for evidence of this area's long history--there's everything from the fossilized remains of prehistoric animals resembling horses, camels, and deer to traces of trade routes used by Indians in the not-too-distant past. Planning to Visit the Orocopia Mountains Wilderness? How to follow the seven standard Leave No Trace principles differs in different parts of the country (desert vs. Rocky Mountains). Click on any of the principles listed below to learn more about how they apply in the Orocopia Mountains Wilderness.